Apterae of Cinara smolandiae in Sweden are dusky brownish grey with dull bronze metallic highlights in sunlight. Cinara smolandiae can be distinguished from related species by the long rostrum (measured as the sclerotized part of the stylet groove) which is more than 1.25 mm and more than 0.37 × body length (see second micrograph below) (cf. Cinara juniperi, in which the length of sclerotised part of stylet groove is less than 1.25 mm, and less than 0.34 × body length). Another distinguishing feature is that the third antennal segment (see picture above) has 2-8 secondary rhinaria clustered at the distal end of the segment. (cf. Cinara juniperi, which has no secondary rhinaria on antennal segment III). 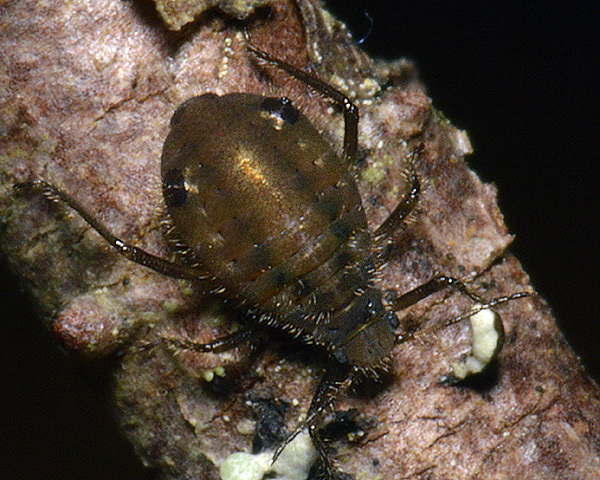 As in Cinara juniperi, Cinara smolandiae has wholly dark hind tibiae (cf. Cinara cupressi, Cinara tujafilina and Cinara fresai which have the hind tibiae mostly pale or with a paler region on the basal half). The siphuncular cones are shiny black. 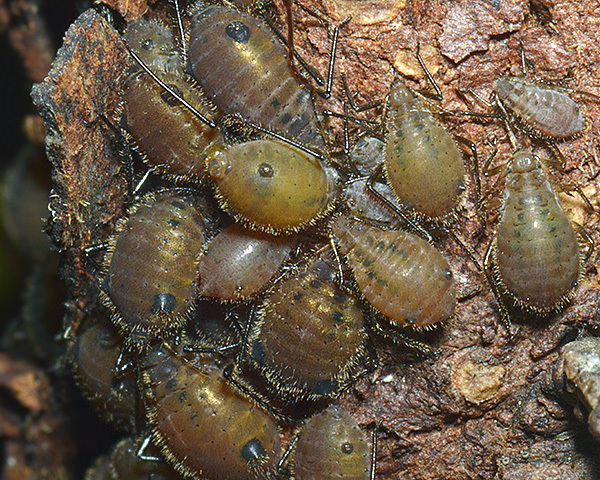 The body length of Cinara smolandiae is usually 2.9-4.4 mm. although Scottish apterae are somewhat smaller. Immatures have more extensive wax dusting. The micrographs below show an adult apterous Cinara smolandiae in alcohol, dorsal and dorsolateral views, the latter showing the long rostrum. The micrograph below show the secondary rhinaria on antennal segments III, IV, & V of Cinara smolandiae in alcohol. Our observations are the second record of Cinara smolandiae in UK to date. The giant juniper aphid was first discovered in Sweden by Danielsson & Carter (1992). It was then found in north-west Russia (Zhuravlev, 2003), Finland (Albrecht, 2010) and Scotland in 2012 (Baker & Blackman, in press). The Scottish Cinara smolandiae populations could not be found again in 2013-2014, but we rediscovered them in 2015 on a recent visit to Dundreggan, Scotland. 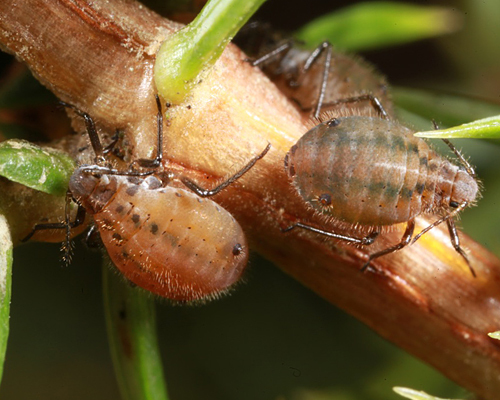 This enables us to revisit some of the points of interest made by Baker & Blackman regarding the size of these aphids, their feeding sites on juniper, colony mobility, ant attendance and natural enemies. Baker & Blackman 2014 noted that the size of Cinara smolandiae from Dundreggan was markedly less than that recorded for Sweden. Only two specimens were available to Baker, so we took a larger sample of adult apterae in an attempt to confirm this observation. The mean body length of these apterous Cinara smolandiae at Dundreggan measured in alcohol was 3.14 mm (range: 2.8-3.52 mm, n=19). The mean length was markedly less (19%) than that of apterae in Sweden (mean:= 3.85 mm, range: 3.33 - 4.25 mm, n=10, measured as clarified slide mounts). Some of this difference results from the different method of specimen preparation. But if we consider the length of the second hind tarsal segment (HT2) (where measurements are directly comparable), it was still 9% shorter in the Scottish specimens. Clarified mounts of (4) additional specimens from our sample were intermediate in size between the (10) Swedish and previous (2) Scottish specimens. It is not clear why this size difference exists - it may relate to the somewhat milder climate in Scotland than in Sweden. 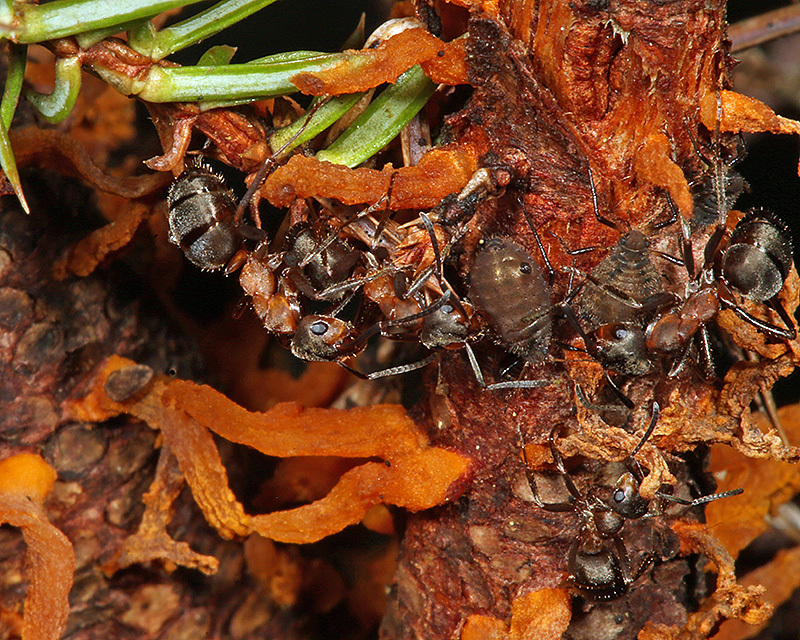 In Scotland Baker & Blackman 2014 found Cinara smolandiae feeding on thin, lignified stems of juniper in June - as shown below for some fourth instar nymphs. This was unexpected because the long rostrum would indicate that their main feeding site was on the older stems. It was concluded that this behaviour was probably restricted to early summer. Image copyright Alan Watson Featherstone/ Trees for Life all rights reserved. 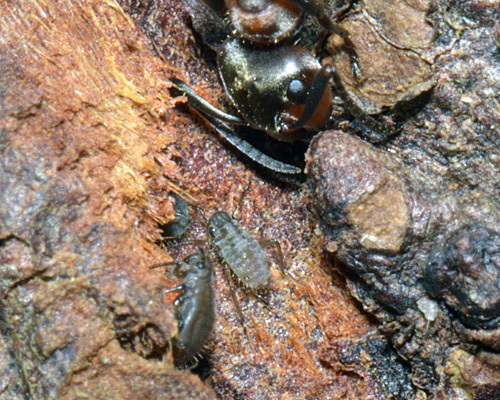 In July 2015 we found them on the older stems of trees in bark crevices or swollen rust cankers - much as with the Swedish populations (see picture below of an adult aptera and alatiform fourth instar nymph). The association with old rust cankers was especially strong - all the colonies we found were on affected trees, and most of the colonies were on or near swollen stems (see pictures below). These rust cankers result from infection with the juniper rust fungus (Gymnosporangium clavariiforme). This fungus has a two-host life cycle. It fruits in spring on juniper as bright orange fingers (see picture below), which gives the name 'tongues of fire' to the fungus. These bright orange fruiting bodies release spores which infect hawthorn (Crataegus monogyna) producing galls on the leaves in late summer. The spores from these galls reinfect juniper. The picture below shows another dense colony on an old rust canker. 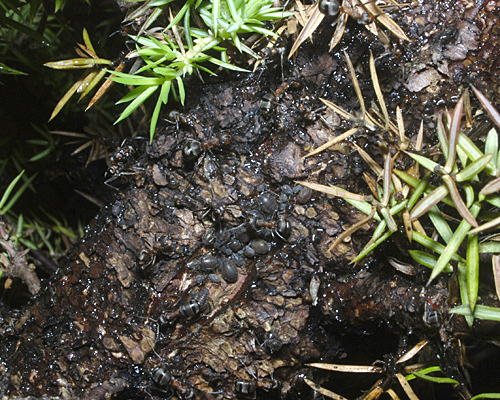 Why there is this association between Cinara smolandiae and the Gymnosporangium cankers is unknown. The explanation is most likely related to nutritional factors. Possibly fungal infection affects the composition of the sap, or makes it easier for the proboscis to penetrate, or (most likely) the plant channels additional nutritional resources to the damaged part of the stem. 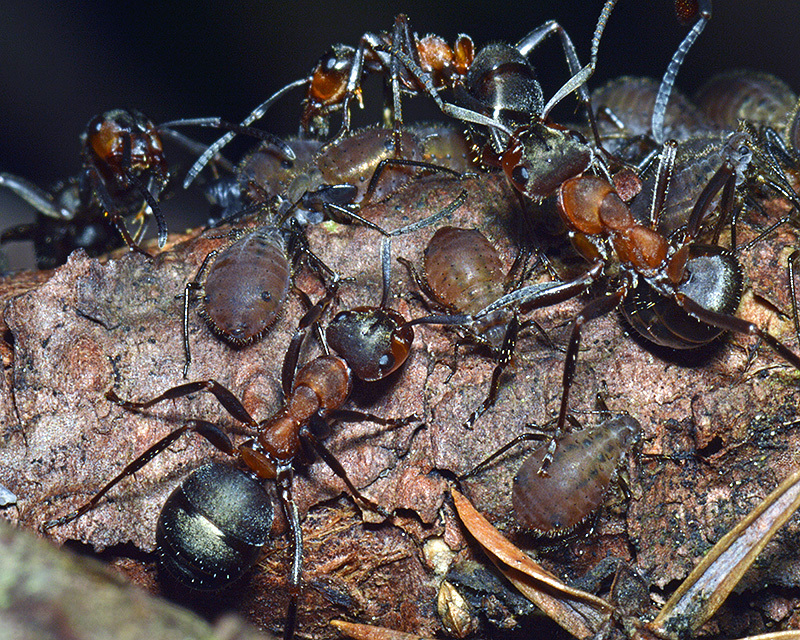 Danielsson & Carter (1992) found that Cinara smolandiae colonies often moved from one part of a tree to another. This behaviour was not noted byBaker & Blackman (2014) and in the few days we were at Dundreggan we also failed to observe any colonies moving their feeding site. 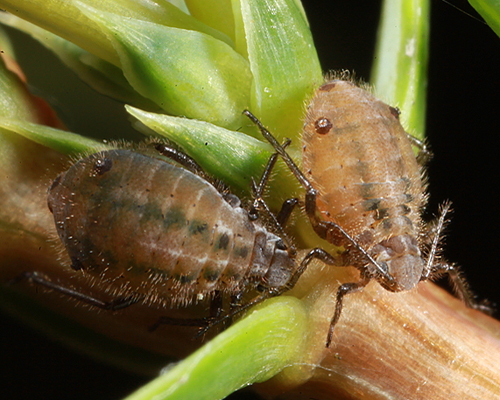 However, such behaviour would explain one characteristic of the colonies that we noted: Most colonies seemed to have a deficit of young aphids given the number of adult apterae present, and several colonies seemed to be comprised mainly of similarly-aged aphids (see picture above). 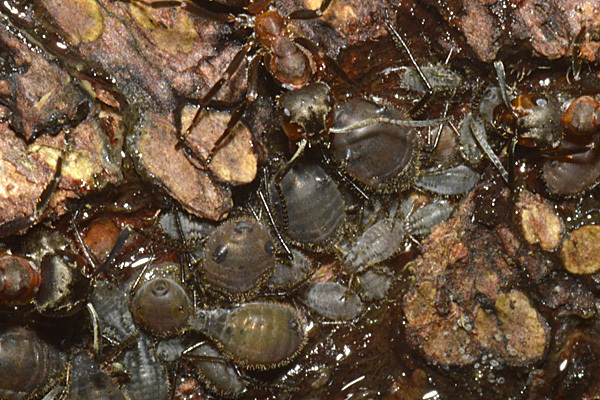 This would come about if the adult apterae were moving their feeding site at intervals, leaving the younger aphids behind to found a new colony. This prompted us to search parts other than the swollen branches of the bushes which had colonies. On one of the bushes we found small numbers of young nymphs (see first picture below) quite separate from the rest of the colony near the base of the bush. This may come about by adults larvipositing and then moving to pastures anew, but there are other possible reasons. 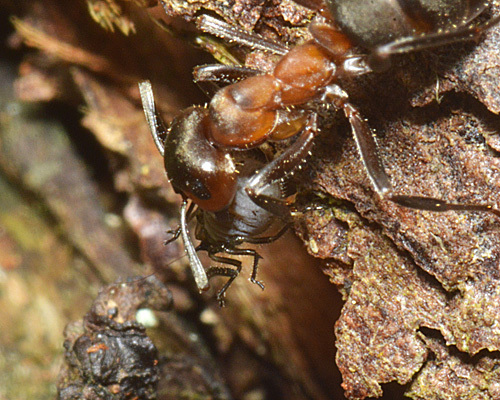 Wood ants (Formica lugubris) were regularly moving between the main colony and the base of the bush, and on one occasion we observed an ant moving an aphid from one part of the tree to another (see second picture above) - albeit this could be a reaction to our disturbing them. 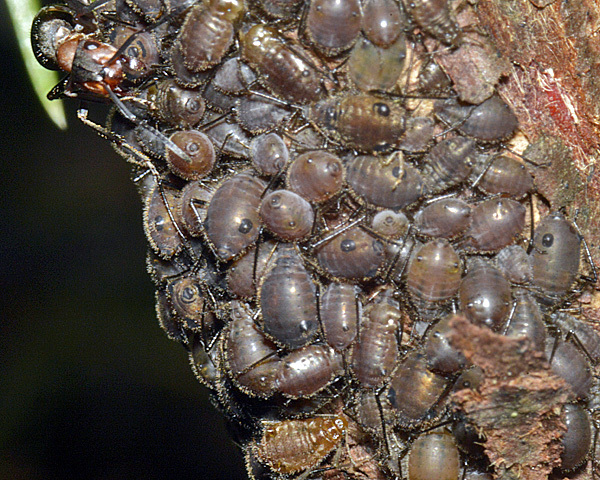 The main exception to colonies having a deficit of young nymphs was where the bark had many deep fissures and crevices (see picture below). Here we found larvipositing adults with an abundance of immatures clustered in the crevices. In Sweden colonies were always ant attended. In Scotland Baker & Blackman 2014 found only one of their two colonies was attended. 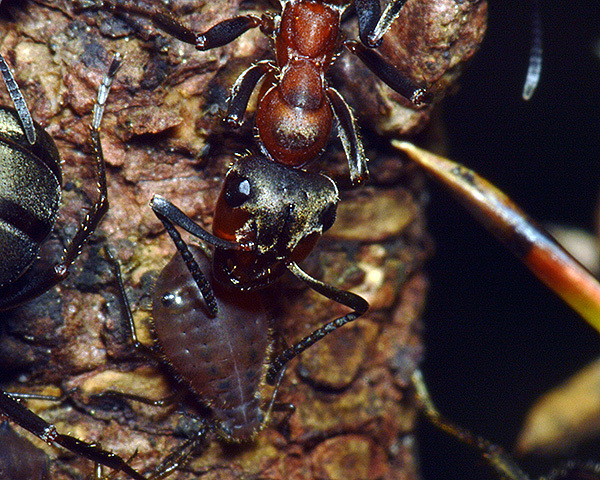 We found all the colonies we found in Scotland were closely attended (and defended) by Formica lugubris. 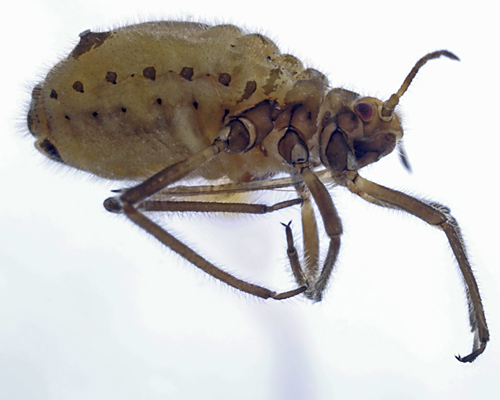 In Scotland Cinara smolandiae was parasitized by the aphidiine Pauesia laricis, a generalist primary parasitoid of Cinara species, but not recorded previously targeting aphids from the subgenus Cupressobium. 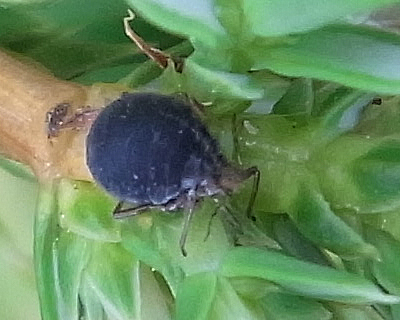 The aphid mummies were blue-black in colour (see below). Guest image, copyright Edward Baker, all rights reserved. 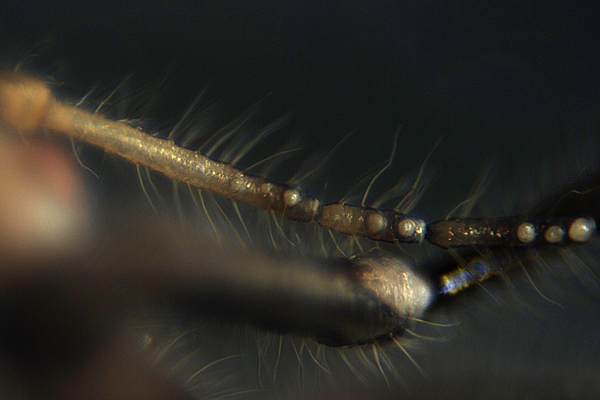 Danielsson & Carter (1992) also recorded parasitism by a Pauesia species in Sweden. 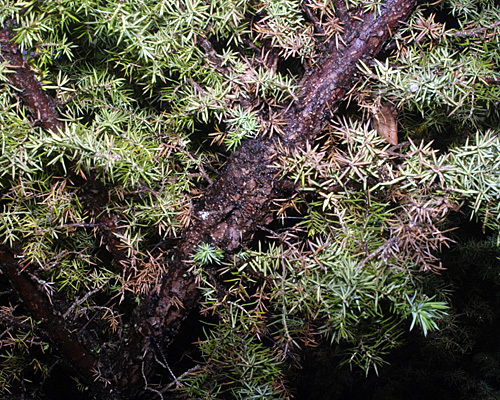 Cinara smolandiae has only been recorded from one Juniperus species, Juniperus communis. Blackman & Eastop list 11 species of aphid as feeding on common juniper (Juniperus communis) worldwide, and provide formal identification keys. Of those aphid species, Baker (2015) lists 6 as occurring in Britain: Cinara fresai, Cinara juniperi, Cinara smolandiae, Cinara tujafilina, Gootiella tremulae and Illinoia morrisoni. 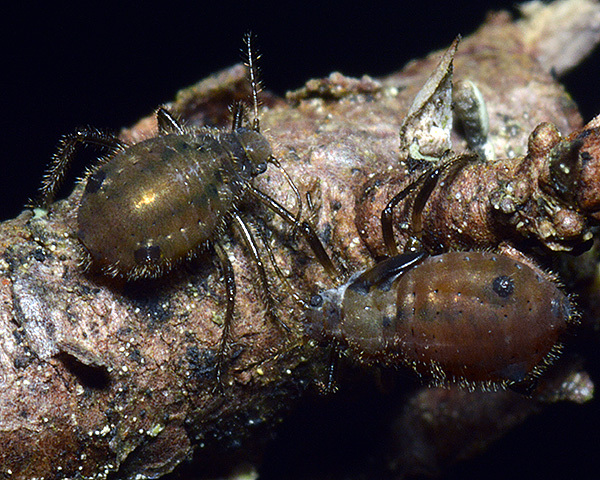 We strongly advocate that Cinara smolandiae should be classified as endangered in Britain (see our rare aphids page). Baker & Blackman 2014 point out that currently no British aphids feature in 'red data book lists' or other nature conservation designations, and argue that Cinara smolandiae is a candidate for such. This is especially so given the rarity of old growth juniper in Britain and the emerging threat to juniper in Britain posed by the invasive fungus-like pathogen Phytophthora austrocedrae (see pdf). 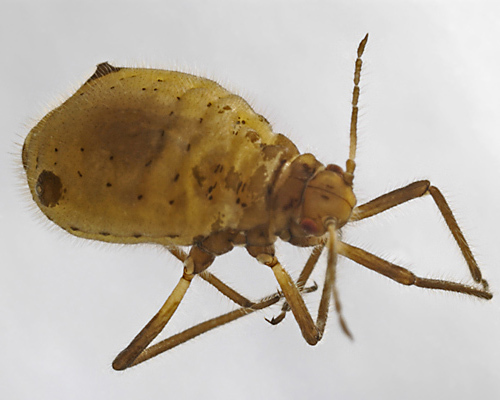 We are very grateful to Alan Watson Featherstone and Ed Baker for allowing us to use their photographs of this rare aphid, to Phil Attwell who confirmed the identity of Formica lugubris from our preserved specimens, and to Trees for Life for financial support. Roger Blackman of the British Museum of Natural History, London (BMNH) identified and measured the Scottish Cinara smolandiae using permanent slide-mounted specimens prepared by Diana Percy and Paul Brown (BMNH).